Jean Twenge knew her daughter was too old for a pacifier but liked the comfort it provided  not only for her 3-year-old, but also for Mom and Dad. Twenge, a psychology professor at San Diego University and co-author of The Narcissism Epidemic  Living in the Age of Entitlement, knew it wouldn't be easy for her to part with the pacifier. So she did what many other modern parents have done and enlisted the Binky Fairy to take her child's pacifiers and (wink, wink) give them to babies who need them. Pacifiers aren't all bad. Sucking calms and soothes babies. 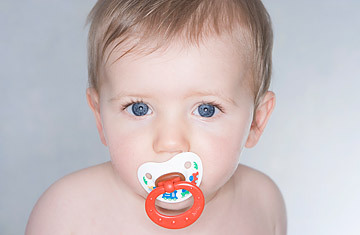 Plus, studies show a link between pacifier use during sleep and a reduced risk of sudden infant death syndrome (SIDS). But when toddlers can give a full report of their day with a pacifier clenched between their teeth, it's time to rethink the binky. In Twenge's case, a few months after her daughter's third birthday, the fairy came late at night and left a few gifts and a note thanking her for helping the babies. "The look on her face when I read the note was a mixture of pride and fear," says Twenge. Blessedly absent was any anger toward Mommy. Many parents today are looking for a buffer in the binky battle. And they could fill a bookshelf with pacifier-purging aids: The Binky Fairy, The Paci Fairy, The Binky Ba-ba Fairy, Goodbye Binky  the Binky Fairy Story. In earlier generations, the Binky Fairy idea might not have flown. Parents likely just took the plug away, and that was that. "Kids wanted to make their parents happy, but today's parents want to make the children happy," says Twenge. Parents who let their kids hang on to pacifiers as long as they want tend to follow the permissive parenting style, which is linked to children growing up to be more narcissistic than their peers, according to Twenge. There are other reasons to break the binky habit sooner rather than later. Pacifier use in the toddler and preschool years can lead to dental issues, speech problems, and middle-ear infections, not to mention becoming a binky addict. Children should not be walking around with a pacifier at age 2, says Jonathan D. Shenkin, a pediatric dentist in Augusta, Maine. According to Claire B. Kopp, a developmental psychologist in Los Angeles, prolonged use of pacifiers into the third or fourth year may indicate that a child is experiencing heightened stress levels, not unlike an anxious adult who reaches for food, coffee or a smoke. "It's best to figure out the cause of stress, such as insufficient Mom or Dad time, erratic sleep or boredom." To break the habit, many parents are fine with turning to a fairy, even if it means fibbing, and these parents have plenty of company. Two recent studies published in the Journal of Moral Education found that parents regularly lie to their children. The practice has been dubbed "parenting by lying" by Gail Heyman, professor of psychology at the University of California at San Diego, and her study co-author, Kang Lee, a professor at the University of Toronto. Heyman says more than 80% of parents lie to their children to try to influence their emotions or behavior. "We were surprised about the extent to which parents lied to children," says Heyman. "They seemed to justify it in terms of a goal they wanted to accomplish." Melissa Burnett published The Paci Fairy in 2008, after her pediatrician in Encino, Calif., instructed her to banish her daughter's binky. Burnett sought a positive, tear-free way of doing so. "It's obvious that children have an addiction, but what's not obvious is that parents share in this addiction," she says. The Binky Fairy might seem to be an easy way out for parents, but so is going cold turkey. "Simply stating, 'We don't use pacifiers anymore' works pretty well," says Dr. Jennifer Shu, co-author of Heading Home with Your Newborn: From Birth to Reality. "Parents are often afraid there will be a lot of crying, but if they're consistent, the child will probably adapt and not even miss the pacifier after a day or two." Buy reprints of TIME's parenting covers.